John Petter was born in 1821 and came from Barnstaple, Devon. As Percy Petter wrote in his autobiography "My father's father, John Petter had been in business in Barnstaple as an Ironmonger, and largely through the shrewd business instincts and thrift of his Cornish wife, Eliza - formerly Bazeley - from Hayle, he built up a comfortable little fortune and lived for many years of my young life at Ilfracombe, and later at the Grange, Yeovil." John Petter moved his family to Yeovil around 1865 when he purchased the ironmongery business of Hannam & Gillett in the Borough. 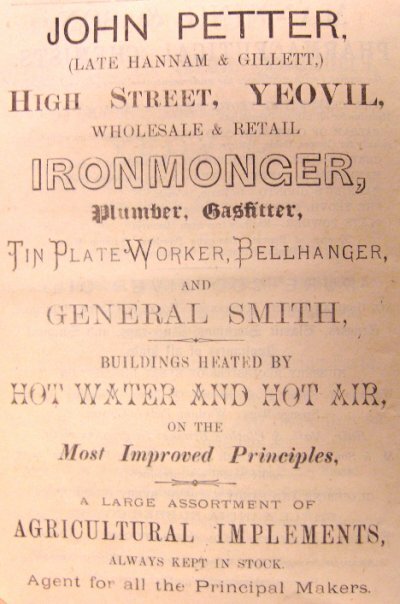 His new ironmongery business was advertised in the Post Office Directory of 1866. In 1870 John gave the ironmongery business to his son, James Bazeley Petter, as a wedding present on the latter's marriage. Nevertheless, John was advertising the business as "John Petter, Ironmonger", for years to come as seen in the 1878 advertisement below from Whitby's Yeovil Almanack Advertiser. In the 1871 census the newly-married James and his wife Charlotte were listed at the ironmongery shop in High Street and 24-year old James gave his occupation as "Ironmonger employing 11 men and 8 boys". Three shop assistants were living on the premises as well as two general domestic servants. John Petter seems to be absent from the trade records after 1878 although in the 1881 census the accommodation over his shop premises were occupied by his clerk William Rodber and his family as well as an ironmonger's shopman and two ironmonger's apprentices and by the time of the 1891 census, John's son James and his family were living above the ironmongery shop in the Borough. In 1888 he was appointed as a Borough Magistrate. In the 1891 census John was listed as a 70-year old retired iron merchant and JP for Yeovil. He was living at his home 'The Grange' in Park Road with Elizabeth, their unmarried daughter Eliza, married daughter Helen and her husband Samuel Page and their two teenage daughters plus a cook and a housemaid. John Petter died in Yeovil in the autumn of 1898, aged 77. John Petter's advertisement in the 1878 edition of Whitby's Yeovil Almanack Advertiser. John Petter's house, 'The Grange', in The Park. 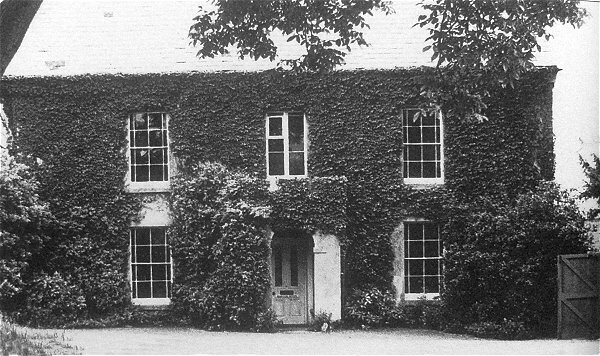 The house was demolished in 1976 as part of the Queensway dual carriageway project.